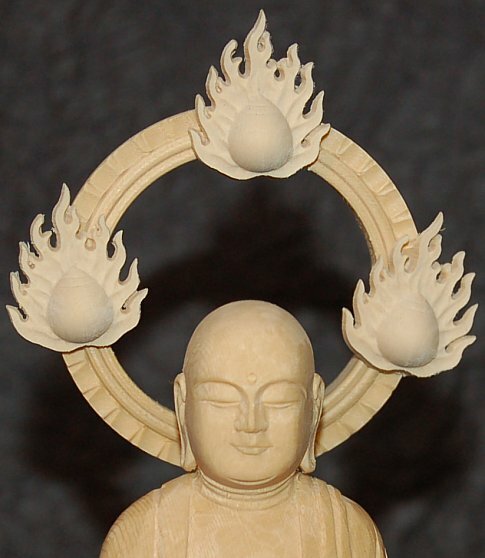 Jizo Bodhisattva is one of Japan's most beloved deities. Jizo carries a six-ringed staff in right hand, representing the realms of karmic rebirth (reincarnation); shakes rings on staff to awaken us from delusion, to help us break free from the karmic chain of rebirth and suffering; in left hand holds wish-granting jewel, which bestows blessings on all who suffer; it grants wishes, pacifies desires, and brings clear understanding of Buddhist Law. Very traditional iconography, with ringed staff & jewel. Learn more about Jizo. and another holding staff with six metal rings.